This is a great book. 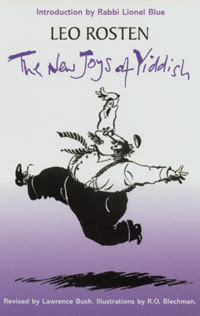 I bought my first copy of The Joys of Yiddish when I was in high school. It’s a classic. My nursing colleagues underrate the value of Yiddish. It’s an expressive language, and it allows you to say a lot of things that would normally get you into trouble. Here’s an example: You get aggravated with someone at work and you call them a putz. The word sounds cute, but it means “fool” or more accurately,“dickhead.” Do you get my point? Yiddish is especially useful in areas of the country where people don’t know what Yiddish is in the first place. A farshlepteh krink—a chronic ailment. It’s no fun taking care of a drug addict who has “chronic pain.” If it’s not one thing it’s another. “My back hurts, I have a toothache, and God forbid, my fibromyalgia.” Some doctors buckle and order Demerol, Morphine, and Oxycontin, and still, nothing is right. Such a farshlepteh KRENK! The emergency room nurse wrinkled her nose when the paramedics brought in the homeless man reeking of alcohol. She said, “Geesh, that guy is FARSHTUNKEN! GONIFF (GAH-nif) n. a thief, a swindler, a crook. A businessman with shady dealings. Our hospital administrator is a GONIFF. He is always looking for ways to cut hospital staff so he can make more money. Some patients think that it’s my job to entertain them when they come into the hospital, and I hate it when they hangout at the nurses station. They keep yacking while I’m trying to get my work done. Some days I feel like yelling, “GAI AVEK!” There’s no party here. Get away from the desk already! FEH (feh) interj. An exclamation meaning pee-yoo!, ieeww!, yuck! , usually used when one gets a whiff of or sees something that is stinky, offesive, or just plain icky. A recently used bedpan that was not emptied. FEH! Enough said. MAZEL TOV (MA-zull-toff) interj. Congratulations, kudos, praise. MAZEL TOV to all of the men and women of the nursing profession! My favorite word is schpilkis which means "ants in your pants" or that you are restless and can't sit still. How to tell someone who's grown up with Yiddish vs. someone who's not familiar with it? If they say K-vetch instead of being able to make the kv a single sound. Oy Gott, ist dass gut! Nobody's mentioned "feh" since my dog ate... well, nevermind. An awesome post. Sei Gesund! It's helpful for lawyers to know a little Yiddish as well. Don't believe me? Would you believe the Yale Law Journal? and who can forget the most famous Yiddish diagnosis for hypochondriacs...GMG- gornist mitt gornist (nothing at all).